It’s hard to believe, but before the Houston Texans came along and there were 31 NFL teams, there was a bye every week — including opening weekend. In 2001, that team that had to sit out the NFL’s first week of play was the Arizona Cardinals. So that “bye” week — if you can call it that, since the Cardinals last played a meaningless fourth preseason game and were mostly just waiting — came and went slowly, and the players were ready to get going with a road game against NFC East rival Washington coming up Sunday. And on the screen, the World Trade Center, both towers, were already billowing smoke. I ended up going over to the Cardinals’ complex earlier than I normally would’ve, because you just wanted to be around people at that point. By then, the Pentagon had been hit and you start thinking that the hotel you are going to be staying at in just a couple of days is only a couple train stops down from the Pentagon and what the hell is happening in the world? I sat staring at the TV screen in the media relations office, and at one point, Pat Tillman sat down beside me just shaking his head, and I couldn’t help but try and get a comment about the Cardinals-Redskins game that was to be played. “The importance of football ranks zero,” Tillman said, and of course he was right. That day, so much was left unknown, but it was quickly determined that the games that weekend would be postponed and frankly, with a 2-year-old at home, flying toward all that chaos wasn’t something I really wanted to do — not that it mattered, after all air travel was grounded for the time being. The Cardinals didn’t play a regular-season game until Denver visited the following weekend. I remember going to New York to play the Giants in December for a Saturday game, and heading out on Friday night with cohorts Kent Somers, Scott Bordow and Pedro Gomez. By the time dinner was over, it was 11:30, and we drove over to Ground Zero. For December, the weather was surprisingly mild, and I remember coming around the corner and being much closer than you’d expect to the crash site. Workers even at that hour continued to plug away at the wreckage, pieces of the bottom of the building still pointing haphazardly in the air around so much debris, the floodlights giving the whole area an eerie glow. Just outside the gates were the leftovers of all the makeshift staging areas from the disaster, hundreds of “Have you seen me?” posters still hanging from those who had hoped against hoped they hadn’t lost someone in the towers. A few weeks later the Cardinals played their makeup game in Washington, and I ended up at the same hotel and I took the train to the Pentagon stop, seeing the damage and thinking how — the previous year — it had been so easy to walk near the Pentagon to see it up close and how that was never happening again. Now, the Cardinals find themselves going to New York this week again, a couple of days after the anniversary. In 2005, the Cards played in New York on 9/11, which was memorable. I haven’t had a trip to New York — including one with my family — without visiting the area, and this time will be no different. Today, there are always a flood of memories that come rushing back from a day, and a time, that will always resonate. It was the last day of the 2003 season, and the Cardinals shocked the NFL — and certainly, the Vikings — when they rallied from an 11-point deficit with less than two minutes to go by winning on a Hail Mary TD pass from Josh McCown to Nate Poole. I was thinking about it again now that McCown, after his long roller-coaster ride of an NFL career, is starting for the Bears after Jay Cutler’s groin injury. Back in 2003, though, McCown was getting a shot at what everyone knew was the end of the Dave McGinnis coaching tenure. McCown not only survived, he impressed new coach Denny Green enough to be the quarterback choice the next year over some impressive potential draft picks (and notably allowing the Cards to pick Larry Fitzgerald.) As it was, McCown made sure the Cards didn’t get (cost them?) the No. 1 overall pick and Eli Manning when he crushed the Vikings’ hopes and dreams in 2003 with his Poole pass. But I digress. The NFL Network, on its 10th anniversary, has made available to teams a handful of historical clips, and I happened to notice one in the system that I had never seen before. It was McGinnis’ locker room speech after that emotional Vikings win. I had never seen it before. Pretty powerful stuff. It was cool to step back in time, to see all those players I used to cover (Anderson sneaks into the Mac video too, just off to the left of the screen, as does current front office man Josh Scobey.) No one says it, but everyone knows it’s goodbye. — What do you want me to say? I don’t think it’s a character flaw that Kevin Kolb gets hurt. Does it hurt when he’s not on the field? Of course. Dave McGinnis used to say “Availability is more important than ability” and in many ways, that’s true. If you can’ stay healthy, the rest doesn’t matter. But you’re never going to convince me Kolb is less of a person because he won’t “tough out” an injury. Especially in a freaking preseason game. The first one, in fact. I would give tonight to John Skelton, obviously. But this isn’t over, no matter how much everyone wants it to be. We’ll see how Kolb reacts this week. Only a couple days of practice before the Chiefs game. — The missed tackles weren’t good, but out of everything NFL teams work on, I always wonder how you can really work on that. Sure you can talk about being in better position, but ultimately, you can never have a full-on tackling practice. That’s reality and maybe the best reason to have five preseason games. — Dave Zastudil had a great day punting in his home state, including a Hall of Fame game record 79-yarder. Michael Adams showed why he’s so great on special teams with the way he saved the ball from going in the end zone. — Rookie Justin Bethel will be a killer on special teams with that speed and ability. Blocked a punt, had a great tackle as a gunner. I think he makes the roster on that alone. — Every time I see Alfonso Smith run the ball, he shows something. I don’t know if he’d ever be a feature back, but as a fourth back, the Cards have something. — That goes double for LaRod Stephens-Howling, whom I really would like to see touch the ball more on offense for the same reason – he just seems to make people miss. — Linebacker Stewart Bradley had a rough year last year, but he made a couple of plays tonight with a sack and a pass defensed. He said he is so much more comfortable. Having him as a workable piece of the defense would make a difference. — Seriously, though, Stew — that sack dance? — Whisenhunt said he thought the offensive line played better after they “settled down,” which apparently was after Kolb was knocked out of the game. — Rookie right tackle Bobby Massie seemed to have a rough night, and Whiz concurred with the assessment: “He looked like he was a young tackle who struggled a little bit. He was beat on up and under (moves) a couple times.” Whiz said they are working on Massie’s set-up so he’s not as mechanical, but that’s something that was going to take longer than a couple weeks of padded practice. — Whisenhunt talked about dealing with some of the young guys, especially at the end when rookie QB Ryan Lindley drove the Cards in a spot to possibly tie the game (first-and-goal) only to have two incompletions and a Lindley pick end the hope. There. Done in 15 minutes. Goodnight. The punishments for the New Orleans Saints — at least most of them, since the player punishments are still TBD — came down Wednesday and they provided the expected doozy: A year-long suspension without pay for Saints coach Sean Payton, an indefinite suspension for former DC Gregg Williams of at least a year, and an eight-game ban for general manager Mickey Loomis. — To begin with, the Cardinals will be the first team to play the Saints, since the teams will match up Aug. 5 in the Hall of Fame game to kick off the preseason. Wonder what the talking points will be during that broadcast? You wonder if the Cards are just going to be in the background, because it’s hard to see the Saints’ storylines not dominating. — The Saints lose second-round picks this year and next. That’ll move up the Cards’ third-round pick a slot sooner. We’ll see what it means in 2013. — Once the regular season begins, the Cards know that Williams, who had since been hired as the Rams’ defensive coordinator, won’t be around. Williams may never be around in St. Louis; commissioner Roger Goodell isn’t assuring anyone that Williams will be reinstated. Not that new head coach Jeff Fisher can’t work around it — former Cards head coach Dave McGinnis, on staff with the Rams now as an assistant head coach, could drop into the DC role like he once did for the Cards. UPDATE: Fisher said the duties won’t go to a permanent DC. He, McGinnis and Chuck Cecil will split the work. 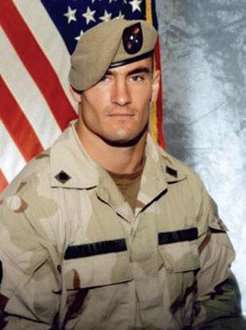 It is Fourth of July weekend, so – while I know everyone knows the Pat Tillman story – I thought I’d take a look back at a thin sliver of the Tillman timeline on this most patriotic of holidays: When Tillman shocked the world and joined the Army. That offseason began like any other. The Cardinals were coming off a 7-9 season, with some hope going forward after Dave McGinnis’ first full season as head coach. The secondary was in flux though – cornerback Duane Starks was a top free-agent target, others were leaving and at strong safety, soon-to-be second-year man Adrian Wilson was being groomed for the starting role over Tillman. That didn’t mean the Cards didn’t want Tillman, a free agent. They very much wanted him back, and put an offer (later learned to be three years and worth about $3.6 million) on the table. Yet Tillman didn’t sign it. He wasn’t at the mandatory minicamp right after the draft in early May, but no one (including me) thought much about it because Tillman was getting married. In hindsight, it did seem strange a guy like Tillman would plan a wedding the one weekend off the offseason he had to be with the team, but again, McGinnis didn’t blink an eye at what Tillman – a guy you wanted on your roster – chose to do. Besides, since he hadn’t yet signed a contract, it technically wasn’t mandatory for him anyway. At one point, it felt like Tillman was hoping to generate free-agent interest but again, looking back that seems silly. Tillman was the last guy interested in developing leverage in a contract spot. Something was up, however. It was impossible not to get that sense, even though no one was saying anything – and at that point, I don’t think anyone really knew. Your mind starts to race, however. I remember thinking, as a reporter, that maybe Tillman was ill. Maybe he couldn’t play football and everyone was trying to keep it under wraps, because why else would he have not signed a contract by that time? On May 23, 2002, then-PR director Paul Jensen asked three media members – myself, Kent Somers and Mike Jurecki – to come meet with McGinnis about something. We went into a back room, and at that point, all kinds of things are going through your head. A few days later, I remember seeing Tillman stopped by the Cards’ offices. He was cordial but he wasn’t going to talk, on or off the record. That was the last time I saw him. People tried to guess why he did what he did. They called him a hero before he had even made it into Army Rangers school, which of course, he eventually conquered – like all the things he conquered in his life. And afterward, it was hard not to remember the things he had said the day after the 9/11 attacks, including how much the American flag meant to him. It was probably just coincidence, because to think otherwise might be stretching things a bit. Still, the Cardinals beating the Redskins, 16-15, on Nov. 5, 2000, just two days before the public vote that would eventually get the Cardinals a new stadium, couldn’t have been timed any better. And, in many ways, couldn’t have been more improbable. Head coach Vince Tobin had been fired just two weeks before. Interim coach Dave McGinnis was at the helm for a team that, when it was over, finished 3-13. The season ended with a seven-game losing streak, and had the breaks not broken as they did that day against the Redskins, the losing streak would have been 11 all told. With many people wondering if the public would indeed approve a stadium for a team struggling so bad, the Cards came up with a win. A crazy win. The Redskins, who were 6-3 coming into the game, outgained the Cards, 431 yards to 178. A bad snap cost the Redskins an extra point, and Washington kicker Kris Heppner missed 51- and 33-yard field goals (yes, Heppner was out of a job the next day). “The kicker choked and that helped us a lot,” Cardinals linebacker Sekou Sanyika said in one of the more blunt post-game quotes I’ve ever gotten. But the lasting memory was cornerback Aeneas Williams. After Washington drove down (easily) to the Arizona 1-yard line, linebacker Mark Maddox stripped running back Stephen Davis of the ball. Williams (pictured below) scooped up the ball in the end zone, got to the sideline and raced a record-tying 104 yards for a touchdown (originally Williams was credited with a 103-yard return but the Elias Sports Bureau gave him the extra yard the next day upon further review). Williams did cartwheels on the field after the Redskins’ final pass fell incomplete, and all that was left was to wonder if it could/would impact the stadium vote. It’s impossible to know if it did for sure, as it was impossible to know if the door-to-door campaigning McGinnis and quarterback Jake Plummer, among others, did too. It was an incredibly close vote. The result for Proposition 302 was impossible to call at first, and the days dragged by with more uncertainty. 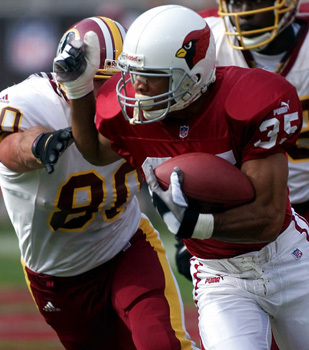 Finally, though, the Cardinals and the 302 crowd were able to claim victory (with about 52 percent of the vote) and what was to become University of Phoenix Stadium took its first — albeit biggest — step forward on Nov. 15, 2000, 10 days after beating the Redskins. Of course, there were some roller-coaster moments while trying to find a site to put the stadium, but that’s a blog post for another day. In this moment in time, Aeneas Williams and the Cardinals pulled out what may have been their most important win, at least in terms of the Arizona Cardinals. It was the vehicle the team needed to reach a competitive level, the centerpiece of a organizational metamorphosis (It’s tough to imagine, without a new building, the Cards reaching a Super Bowl). Plus it kept the team in town. I wasn’t planning on trying to go to California to cover the Los Angeles Cardinals.